Posted March 11, 2004 by Emmet Farrell in News. Compántas Lir back on the road with an adventurous play about a play Compántas Lir mark 21 years on the road this year with their production of the classic comedy Play On by Rick Abbott which opens the Claregalway Drama Festival on Friday. This is the 20th three-act play from the award winning group as they build towards a special celebration next year, and hopes are high that they will be able to make another bid for All-Ireland glory in the coming weeks. Have you ever wondered what goes on behind the scenes of a play? Or thought of all that can go wrong with a production. 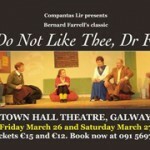 Then come along and see this show when it opens the Claregalway Drama Festival on Friday night. In this play about a play, Murphy’s Law reigns as a community theatre group struggle to put on a murder mystery written by a novice playwright who unfortunately for the cast continuously rewrites the play. With days to go until opening night, tensions are high. It is filled with creative divas, abrasive personalities, missed cues and technical blunders which combine to show the magic and mayhem that can go on in local theatre. The actors generally work together but when their nerves get the better of them, sparks fly and minds go blank with hilarious consequences. Mike Hession has taken on the role of producing this year’s play which started on the All-Ireland circuit last week and which will be touring the country for the next month, before ending its run with a three-night stint at the Town Hall Theatre, Galway on April 16,17 and 18 for which tickets are now available at (091) 569777. The cast includes the experienced Fidelma O’Rourke, John Heneghan, Mike Hession, Patsy Cahalan, Bernadette Prendergast and Brid Conneely while relative newcomers Declan Varley, Mick Dwyer, Dermot Hession and Mairead Duffy make up the cast. Indeed, this will be Dermot’s first play with the group, but coming from a family of dedicated thespians and performers, what hope had he of avoiding the stage bug? Reaction to the previews has been very positive with all observers praising the bravery of staging this technically difficult play in which the Compantas Lir actors have to play bad actors However, the ever adventurous group are confident of giving a good night’s entertainment to all who come along to see it in Claregalway and in the Town Hall Theatre. Hello and welcome to our March issue of Nuacht Chláir. We had a great response to our Kids Korner colouring competition last month and it was quite difficult choosing a winner. Well done to Conor Fahy as our chosen winner. No excuse to sit in from the 12th to 20th March – drama fever takes place again and as usual our local group will entertain as always. Best of luck to all involved in the Festival. If you want to communicate faster, read all about Broadband here. The more people who log on the more likely it is that broadband will come here. The Lackagh Branch of Comhaltas Ceoltoiri Eireann will hold its annual Traditional Music Feis at the Social Centre Lackagh on Saturday March 27th and Sunday March 28th 2004. Competitions for beginner and advanced levels covering a variety of instruments. Also duet and trio competitions under 8/10/12/14 and over 14. Special Perpetual Trophy competitions under 10/12/14 and over 14. Under 8, 10 and over 14 competitions will be held on the Saturday and the under 12 and under 14 on the Sunday. The Western Health Board are running a campaign during February and March to encourage the safe disposal of any old and unwanted medicines. Medicines are the number one cause of accidental poisoning in young children. There were 2233 cases where children under 5 had swallowed medicines reported to the National Poisons Information Centre in 2002. The campaign advises you to bring back any unused and unwanted prescription or over the counter medicines, no longer required, to your local pharmacy for safe disposal. Medicines, which have passed their use-by date, may have no effect at all, and could in fact be harmful. Medicines should be stored in a cool dry place out of the reach of children. The bathroom cabinet is not an ideal location due to humidity, which can decompose medicines and alter their effect. Some medicines have specific storage instructions e.g. refrigeration. E.G. certain eye drops and antibiotics. Most eye drops only last for 28 days once opened so careful reading of the manufacturers instructions is important. This campaign will contribute towards safety in the home. At the same time, it will result in the removal of potentially dangerous substances from the waste stream and safeguard against their disposal in a dangerous manner. Happy 21st birthday to Samantha Murphy, Cregboy on the 10th March. Birthday wishes to Kate Carr, Cregboy, who will be 7 years old on the 15th March. Happy 21st birthday to Laura Kenny, Clogher on the 19th March. Have a great party Laura! Brian Loughlin, Cregboy, celebrates his 21st birthday also on the 28th March. Congratulations to Amanda O’Farrell, Business Development Manager, Escape Leisure Centre, Claregalway Hotel, who got engaged to Jarlath Sweeney, Donegal town. Jarlath is also working in Escape Leisure Centre as fitness manager. For general care there is no substitute for putting your feet up. As well as helping you relax, raising the feet helps circulation in the legs by removing the effects of gravity, so it’s easier for blood in the legs to make its journey back to the heart. Putting your feet up when you can, will also help prevent varicose veins. Really hard-working legs deserve a special treat such as having a pedicure on a regular basis. add 5 drops of lemongrass, 5 drops of lavendar, 5 drops of juniper. A foot massage using this blend will relax and revive a pair of tired feet. The remains consist of a long rectangular church, probably of medieval date. When the church went out of use the interior was used as a burial ground. Now it too is no longer in use and has become neglected over the years. The last burial there was in the 1960s. As it presently stands the church is in a dangerous structural condition due mainly to a dense cover of ivy that has penetrated the existing walls, dislodged the masonry and broken up the mortar. The walls are weakening at the base and are in danger of falling. The burial ground is also in a much neglected condition. It is extensively overgrown with a variety of trees, shrubs and brambles. This old graveyard is situated in the heritage zone of Claregalway village. As can be seen from the attached 25.3 inch O.S. map, both the Franciscan Friary and the De Burgo castle are situated about 100 metres from it, across the Clare River. Also the well known Nine Arch Bridge is about 50 metres away, across the main road. The because of its location and the overgrown vegetation, the graveyard has a low profile and is known mainly to locals. The committee will ensure that the guidelines as contained in the booklet ‘The Care and Conservation of Graveyards’ by the Heritage Service will be followed. Also we are fortunate that we will have the services of a conservationist architect who lives in the area and who has helped in the past with the restoration of the Nine Arch Bridge. While the immediate benefit will be to conserve the church walls, the longer term benefit will be to raise its visual impact and by complementing the other nearby historic structures will further raise the awareness of heritage in the village. Provision of 30+ townland names in Claregalway and surrounding areas. Restoration of the three pumps in Claregalway, Montiagh and Cloon. Provision of bottle– banks in Dunleavys car– park. Landscaping area adjacent to Claregalway N.S. and the erection of the Famine Stone in the same location. Planting of trees in area on main road. Restoration of the Nine Arches Bridge in Claregalway. Provision of Naíonra (Irish playschool) adjacent to Claregalway Leisure Centre. Initiated contact with G.K. Construction for tarmacadan of Leisure Centre, which was carried subsequently out in conjunction with Claregalway G.A.A. and the Leisure Centre. Erection of 3 “Welcome to Claregalway” stones on approach roads to Claregalway. Urban and Village Renewal Scheme – the Amenity Group has been approved for €70,000 by Galway County Council. In addition we will be assigned, free of charge, the services of an architect who will help in drawing up plans. A meeting with the architect, Galway County Council and area engineer has already taken place with another one to follow soon in relation to how funding is to be spent. Heritage Council – the Amenity Group have been offered a grant of €4,000 from the Heritage Council towards the cost of conservation of the old cemetery. The total cost we looked for was estimated to be €11,900, so a shortfall of €7,000 needs to be raised. This is where YOU the community come into the picture!! We need help to raise the remainder. Anybody out there with ideas? The Amenity Group have undertaken the above projects with committed volunteers and we now take this opportunity to appeal to all members of our community to become involved in building the Claregalway of the future. Baby plants are a great way of purchasing pre-germinated seedlings, these germinated seedlings, or jumbo plugs, come in cells in unheated propagators and all you do is sit them somewhere warm and bright and they’ll produce fantastic plants ready for planting on into baskets and containers during early May. Plants like petunias, busie lizzies, geraniums, beautiful lobelias and begonias are now ready for planting. All these popular varieties will reward you with lots of summer colour from June to October in containers, baskets and flower borders. Because the baby plants are four weeks old and ready for planting now they settle in very quickly and give you guaranteed returns. Baby plants really come into their own if, like me, you like growing your own plants but don’t need 200-300 petunias, 6 or 12 is ideal for 2 hanging baskets; mix these with a half dozen lobelia plants and some begonias and you have the perfect hanging baskets- without having to fill every windowsill in your house with seed trays, pots of seeds or margarine tubs filled with young seedlings. Also the treacherous damping-off diseases, and all the other fuss associated with seed growing, can be avoided as Baby plants are purchased past the stage where this can be a problem – but still very economical. What Baby plants are available from Horkans Garden Centres? Many, many varieties of trusty annuals are available in the Baby plants range including Begonias (including the cracking dark leaved varieties), Dianthus, Geraniums, Impatiens, Lobelia – both trailing and bush species, Gazania (Gazanias are amongst the most beautiful plants you can grow. These produce large daisy-like flowers in a super range of colours and bicolours. And of course, no summer garden could ever be without the gorgeous Petunia – these ever popular annuals come in a wide range of colours, but look out for the aptly named Burgundy types. These beautiful free-flowering plants produce lots of luxuriously coloured velvet feeling flowers. After planting up your developed plants into basket and tubs, feed continuously once a month with a fertilizer high in Potash to stimulate the abundant production of flowers – Algoflash is ideal. We use this in our centres and find this excellent. All in all…..a very easy way of producing lots of fabulous plants easily, with little effort. A highly recommended way of successfully producing your own tub and basket plants. The Planting of summer flowering bulbs has been gaining great momentum over the past few years as we all realise that it is possible to grow those ‘Florist shop’ flowers in our own home, in fact it is as easy to grow large trumpet lilies and the beautiful architectural gladiolas as it is to grow daffodils and tulips. Generally all Spring and Summer flowering bulbs prefer a rich free-draining soil in a sunny spot. To provide the optimum growing medium for your bulbs plant them in Westland Multi Purpose Compost, this superior compost mix contains Perlite which helps to prevent the compost from water-logging and therefore preventing the bulbs rotting during dormant periods. The more exotic species, like the super Alliums (ornamental onions), make unusual specimens for patio pots, and are ideal placed next to Hostas and other large leaved plants, loud half-hardy annuals and coloured foliage to create a tropical effect. Remember…Gardening is all about thinking ahead – Plant today for a riot of colour tomorrow! Alliums include some of the most spectacular summer bulbs of all, with their large pom-pom like flower heads reaching a height of 2ft on sturdy -wirey stems. Varieties to look out for include A. sphaerocephalon and A. cristophii. The striking globes of Alliums flowers in metallic pinks and purples look dramatic grown through perennials, like Ajuga, Agapanthus and Astilbe in full bloom. Don’t rush to deadhead your Alliums, as the seedheads look spectacular while covered with frost on a winter morning. Pure class. For strong colour accents look no further than the fiery Crocosmia. They quickly form bold clumps that benefit from dividing every few years. These upright plants have long Iris-like leaves, which look super swishing in the wind, and in late summer produce long freesia-like corsage sprays of fiery colour. A bulb, which is actually good in heavy soils. In Scotland, during cold winters, we cover the roots of Crocosmia with bark chippings for protection after the leaves have died down for winter. Certainly a tip to remember if this winters weather is to be repeated next year. Not often seen in Ireland, but a plant with very striking flowers like pale orange or yellow rockets shooting up from the back of a well drained border in early to mid-summer is Eremurus or as its commonly known the Foxtail Lily. Sadly for such a beautiful plant the flowers don’t last long, but will repay your favour with a stunning display of seed heads. Remember to tune in each week to our special look at gardening on Mid & North west radio station at 10 past ten this and every Saturday morning. Organic Seed Varieties – New to Horkans for 2004. Horkans have added over 50 varieties of organic vegetable seeds to their extensive range of veg & herb seed varieties. This unique range of seed is harvested from 100% organically grown vegetables registered by organic producers world wide. All the popular varieties are included – beetroot, tomatoes, cabbage, carrots, peas etc. So go that one step further this season and sow fresh organic seed this season from Horkans. Our Gardening Hints & Tips this Spring. Kill moss growth on your tarmac or lawn area with Armillatox. Apply a dilution directly onto the affected area with a sprayer or watering can, this will ensure a moss free area this season. Armillatox can also be used on tiles and walls for moss or algae removal. Now is a good time to treat your lawn to a 3 in 1 weed, feed and moss killer. Apply easy green total lawn feed for a rich green colour that does not force grass growth. Easy green is easy to apply and works rapidly to green up and weed free your lawn. Plant summer flowering bulbs now into small pots, use good quality compost like shamrock multi purpose compost. Place the planted bulbs in a bright frost-free location – a windowsill or porch is ideal. By mid May the plants are ready for final planting. Plant out into containers or borders for a blast of colour this summer. Kill weeds on patio slabs or tarmac with ‘clean up ‘ weedkiller. Clean up will remove unwanted weeds and help to prevent new weed growth. Clean up can be applied in dry weather for maxinium effect. Clean up is also ideal for graves and paths. Garden plants and shrubs will all benefit from a dressing of supergrow shrub fertiliser. Supergrow encourages strong leaf and stem growth and helps to build strength into all garden plants. Super grow is ideal for trees, shrubs and hedging plants. Apply now and in mid summer. Broadband is an always-on internet connection that gives you high-speed access and downloads for a flat rate monthly charge. Broadband is a complex word for a simple but utterly profound change in the way the internet works. Broadband means speed – and lots of it. You upload or download pictures faster. You can be more creative and functional because now you have no time or cost limits. You can more easily download a large file, send photos, watch news videos and hear streaming audio. There are different ways of accessing the internet using a broadband connection. Most people use a connection via their existing telephone or cable line. However, broadband is also available using other technologies including radio, satellite and power lines. Broadband services are ‘always-on’. This means that broadband is a permanent connection to the internet. A broadband connection lets you access the internet from the minute you switch on your computer. There’s no need to dial up to the internet or log off once you’ve finished surfing. You simply pay a flat fee each month with no additional charges for the amount of time you spend online. Broadband is currently only available in selected areas around Ireland. At the moment, broadband is only available in Claregalway by satellite, meaning it costs nearly twice as much as areas serviced by Eircom’s or other provider’s cable broadband. Cable Broadband is being brought to areas with the highest demand for it. Fill in your First and Last Names, Telephone Number (including area code, e.g. 091 xxxxxx) Email address and whether or not you are the bill payer. Then click the Select box beside County and scroll down to Galway. The page should load again, with the relevant towns and areas. Now click the Select box beside Town/Area and scroll down to Claregalway. You should see a page telling you that you’ve successfully voted for broadband in Claregalway. Don’t forget to tell any friends that would like to see broadband in Claregalway to get online and vote for it. The more votes for Claregalway, the more likely it is that broadband will come here. I am very pleased that as a result of representations made by me that the Co. Council have carried out much needed road repairs to the road between Lydican and Cregmore. 2. The Director of Services for Roads and Transportation is now looking at the question of speeding, particularly in the morning and evening on the stretch of roadway between Cregmore Cross and the Lydican Road where it meets with the N.18. He has been asked to prepare a traffic calming scheme for the area. 3. I have allocated Notice of Motion so that the entrance to Cloonbiggeen off the N.17 can be landscaped. 4. The Council are to erect a sign at the junction of the N.17 with the Corrandulla Road so that strangers coming up to the Corrandulla Road onto the N.17 will know whether to turn right or left for Galway and I have also authorised that some Notice of Motion money be used for this purpose. 5. Recently I raised the serious traffic problems for people trying to exit onto the N.17 from the Riveroaks Estate and also the provision of a footpath between the new housing estates of Church View and Sli an Bradan. I am not satisfied with the response I have received and will be taking up the matter again. I am not satisfied that a person has to be injured at one these areas before the safety question is addressed. 6. Recently the Council dealt with the proposed increases in Development Charges and as you will know I made my position known from the outset that I was totally opposed to any increase in these charges for one of rural housing. I am glad to say that the Council have agreed to my request. I also sought from the Council that 100% of all money raised by way of Development Charges in this Electoral Area should be ringfenced and spent in this area. Unfortunately, I could not get the support of my fellow councillors for this but in the end they agreed that a minimum of 50% of the money raised would be spent in this electoral area. This is the first time that the concept of ringfencing of this money has been adopted by the council. At least 50% is a start in the right direction. This money can be used by the Council to provide much needed extra sporting facilities for the youth of the area and also to fund other projects such as footpaths, lighting etc. 7. I would like to remind voters that they have until May 24th to be included on the Voters register supplement. You can have the register checked at the Post Office, Garda Station or County Council to see if you are registered. Anyone who is 18 years or over dan apply to be included on the register if they are resident in this electoral area. Following on last year’s tremendous success with the production of Agape, Gather Music Project have come together again with a new show called Feast of Life by Marty Haughen. 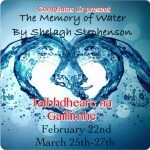 It wll be staged at the Black Box Theatre on Wednesday 24th, Thursday 25th and Friday 26th of March 2004. One hundred and ten people of all ages and from various lifestyles and Christian traditions have rehearsed hard every week since last October to attain an excellent standard of vocal performance. The project consists of a cast drawn from a great assortment of backgrounds: choir members from diocesan parishes, members of the United Methodist and Presbyterian Church, members of the Galway Garda Choir, members of the Refugee and Asylum Seekers community and schoolchildren to name a few. The aim of the project is to create an atmosphere of welcome and inclusion, to give people of all colours, creeds and lifestyles an opportunity to generate an energetic and upbeat spiritual celebration together. On a personal note, my Sundays will never be the same again!! As aforementioned, since last October, the group have been coming together in the Jesuit Hall creating all kinds of sounds (as Dee will testify to!!). We are privileged to have Dee (Deirdre) Newell as our musical director. Her talent is unreal. Aidan Larkin, Tina Lally and Fr. Frankie Lee are to be credited for bringing this project to fruition with such a large cast. Local people involved in Feast of Life include: Mary Casserly, Coman Duke, Josette Farrell, Rachel Farrell, Ailbhe Hession, Catherine Hession, Julie-Anne Hession, Pat Heneghan, Eleanor O’Reilly. Chorographer is well known Andrea Lenihan from Claregalway. Do come along on the night – a show not to be missed! Wider freeways; but narrower viewpoints. We spend more but have less; we buy more but enjoy less. We have more degrees but less sense; more knowledge but less judgement. More experts, but more problems; more medicine but less wellbeing. We spend too recklessly, laugh too lttle, drive too fast. Get too angy too quickly, stay up too late, get up too tired. We’ve been all the way to the moon and back ; but have trouble crossing the street to meet a new neighbour. We’ve cleaned up the air but polluted the soul; We write more but learn less; plan more but accomplish less. We’ve learnt how to rush, but now how to wait. We’ve higher incomes but lower morals. We build more computers to hold more information, to produce more copies than ever, but have less communication. These are the days of two incomes but more divorce. These are the days of quick trips, disposable nappies, throwaway morality, one-night stands, over-weight bodies, and pills that do everything from cheer, to quiet, to kill. VALENTINES NIGHT IN CUPID’S CASTLE CONSIDERED A SUCCESS! The Valentines night of ‘lurve’ held in Cloonacauneen Castle in aid of MSIreland raised over €3,500 with money still flowing in to the worthy cause. It was an eventful night with four women well known within the drama circles of Claregalway – Sylvia Nolan as “Helen Hoare”, Collette Whisler as “the widow” and Mary Ann Wangari as “Bridget White”. They kindly donated their time and energy into the event providing an extremely entertaining night with lots of spirit and innuendos!!! Games of Blind Date for the singles and the “Dinner of Love” for the couples proved a little challenging for the contestants but the winners were happy! I would like to take the opportunity to thank all of the local shops, salons, pubs and restaurants in Claregalway and Galway city who sponsored prizes for the charity event. Also to Tendafrost foods for the food on the night as well as Cloonacauneen Castle who kindly offered the venue for the night. The winner of the main prize Maria Duggan of Renmore won a weekend away in any one of the Quality Hotels in Ireland which was generously sponsored by Padraic Connolly of Rockmount, Claregalway. I would also like to thank my neighbours and friends who helped with the night, ye know who ye are!!! Patrick Lawlor and P.J. Moran were very helpful with the security element which involved only prying of amorous couples apart!! I am well on my way to raising the €4,650 for the sponsored charity trek which I will be undertaking in October of this year. If anybody wants to donate money to this worthy cause, feel free to contact me on (087) 1361556.